Bet the Dodgers in five games at +450 with 888Sport. Bet the Dodgers in six games at +400 with 888Sport. Bet the Dodgers -1.5 games +135 with Karamba. It is easy for MLB betting fans to visualize either the Brewers or the Dodgers in the World Series as the winners of the National League Central and West breezed through the division series – Milwaukee in a three-game sweep of Colorado, Los Angeles in a four-game thrashing of Atlanta. However, only one can hoist the pennant after the teams’ first-ever playoff meeting in the NLCS. The Brewers have never won a best-of-seven series, falling to the Cardinals in seven games in the 1982 World Series, then again to St. Louis, in six games, in the 2011 NLCS. The Dodgers, meanwhile, are the reigning National League champions, having bested the Cubs in five games in last year’s NLCS. The last two defending pennant winners in the NLCS have lost: last year’s Cubs and the 2014 Cardinals. The Phillies of 2008-09 were the last Senior Circuit club to pull off the repeat. In more recent history, the Dodgers won this year’s season series against the Brewers, 4-3, with each team winning one game in the other’s park. Before we get to some serious World Series betting advice, here’s how I see the NLCS. 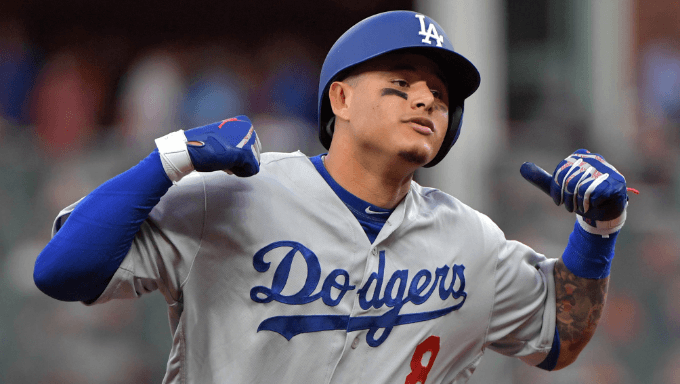 The Brewers have home-field advantage in this series, but are priced at +115 to win it at 888Sport, with the Dodgers favored at -143. Depending what side you’re looking at, that feels like a steal either way: The team with the best record in the National League as underdogs, or a supercharged Dodgers roster firing on all cylinders at a bargain price. Why such a bargain? Los Angeles can run out Clayton Kershaw, Walker Buehler, Hyun-Jin Ryu, and Rich Hill as starters, while Milwaukee relies far more on its bullpen, even having gone to ol’ Johnny Wholestaff in Game 1 of the Colorado series. The gambit worked against the Rockies, but it’s much riskier to run a bullpen game in a 2-3-2 series, and it’s hard to see the best offense in the league not teeing off on Milwaukee’s array of “huh, that guy’s been getting it done somehow” starters. Put a different way, the Brewers are good, but played a Rockies team whose weaknesses were easily exposed, and who never got to throw Kyle Freeland at them, while the Dodgers, even in dropping Game 3 in Atlanta, had a Death Star kind of look about them – even in that Game 3, Los Angeles erased an early five-run deficit. If you’re bullish on the Dodgers, it’s probably a good idea to take a gander at the +135 line for the series games spread at Karamba, with Los Angeles -1.5 for that price. Better still, if you figure the Brewers are good enough to win at least a game in the series, split Dodgers in 5 at +450 and Dodgers in 6 at +400 with 888Sport. The sweep is +1000 for a reason, while Dodgers in 7 is +450 with 888Sport because of Milwaukee’s home-field edge. The bet to stay away from is the total games in the series, where you’ll find over 5.5 at -182 and under 5.5 at +145 with 888Sport. The last 10 NLCS have featured one sweep (Mets over Cubs in 2015) and one seven-gamer (Giants over Cardinals in 2012). That tendency toward five- and six-game series is only exacerbated by the possibility of the Dodgers winning in five or the Brewers holding serve at home, where they are 53-30 this year, winning a game in Los Angeles and closing it out in six. For what it’s worth, Brewers in 6 is at +500 with Karamba, while Brewers in 7 is a +425 line. Milwaukee’s lineup is good, but winning multiple games at Chavez Ravine feels like too big of an ask when the starting pitching matchups are going to be this lopsided and the bullpen advantage is not as big as it may seem.